Alex Morgan had seven goals and two assists in 14 games for the United States women’s national soccer team in 2017. U.S. women's national team and Orlando Pride forward Alex Morgan was named to the FIFPro Women's World XI team for 2017 on Thursday. It's the second straight year she's been honored by her fellow members of the global soccer players union. "It's always exciting to be considered as one of the top players in the world," Morgan said in remarks issued by FIFPro. "For women's football to have our own World XI is incredible. It helps promote the women's game. It helps female footballers recognize the talent among their peers and I'm really happy to encourage and be a part of that." The award was announced on Thursday to coincide with International Women's Day. FIFPro said that more than 4,100 female players at first-division teams across 45 countries participated in the voting. "I feel like we as a women's national team have come so far with fighting for equality and attaining that little by little," Morgan said. "Who's really going to reap the benefits of it? It's the next generation, not us. We know deep down that in 10 or 20 years it's going to be so much better. … Having the World XI announced on International Women's Day just speaks volumes to how committed FIFPro is to the women's game to celebrate female players at the top of the world.."
In 2017, Morgan had seven goals and two assists in 14 games for the national team and nine goals and four assists in 13 games for the Pride. She spent the first half of the year at French club Lyon, Europe's biggest team, scoring 12 goals in 16 games. Lyon swept the French league, French cup and UEFA Champions League. Morgan is the only U.S. player to make the World XI list. It's the lowest number of Americans honored in the award's three-year history. There were four last year (Morgan, Delran's Carli Lloyd, Ali Krieger and Hope Solo) and four the year before (Lloyd, Solo, Julie Ertz and Meghan Klingenberg). The drop this year extended to the 55-player list of finalists. Morgan and Lloyd were the only Americans on it. 2017 wasn't a vintage year for the national team, to be sure. The Americans finished last at the SheBelieves Cup, with losses to England and France. 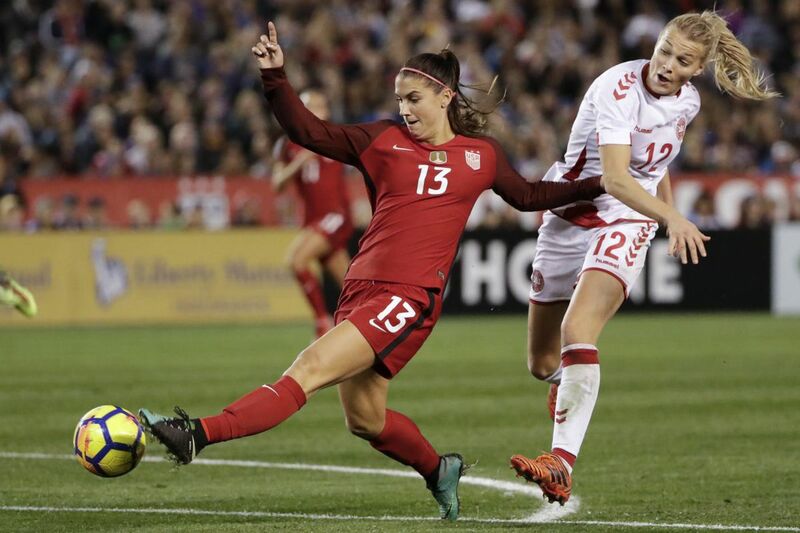 At the summer Tournament of Nations, Jill Ellis' team lost to Australia for the first time ever and needed a stunning rally from 3-1 down in the last 10 minutes against Brazil to win 4-3. Nonetheless, there were positives. Ertz scored six goals in 12 national team games, and locked down a starting role in defensive midfield. Samantha Mewis became a two-way midfield stalwart, and helped the North Carolina Courage reach the National Women's Soccer League title game. National team co-captain Becky Sauerbrunn had another strong year at centerback. Lloyd had two goals and two assists in 14 games for the national team. At club level, she spent part of the year at England's Manchester City, where she scored two goals in six league games and one in the FA Cup final, which City won. She also played in the UEFA Champions League, scoring in the quarterfinals and facing off with Morgan in the semifinals. When Lloyd returned to the NWSL's Houston Dash, she scored two goals in eight games. Her season was cut short by an ankle injury that kept her off the field from mid-August until mid-October. The flip side of the lack of Americans in the FIFPro XI is the growing strength of women's soccer worldwide. A record nine national teams are represented this year. Spain, last summer's European champion the Netherlands, and runner-up Denmark are there for the first time ever. Clubs from six leagues are highlighted. The NWSL's players are Morgan and her Orlando teammate Marta. The Brazilian legend is still one of the world's top playmakers at age 32. She had 13 goals and six assists in 23 games for the Pride. Last year was her first in a U.S. league since 2011. "This shows I can still play at the top level. I'm very happy. It's also motivation for me to keep pushing myself," Marta said. "A few years ago I said I would play until I was 30 [she's now 32], then I said I would play to the next Olympics, and then I said I would play to the next World Cup. Now I don't think about when I will retire any more. Last year we had a strong championship with Orlando Pride, which was very inspiring for me – I hope those fruits we planted will keep growing." Forwards: Alex Morgan (Orlando Pride and United States), Pernille Harder (VfL Wolfsburg and Denmark), Lieke Martens (Barcelona and Netherlands). It's no surprise that Lyon has four players in the XI (five if you count Morgan). Paris Saint-Germain reached the Champions League final, beating Barcelona in the semis. Wolfsburg is the reigning Bundesliga champion. Chelsea won the English title in a shortened season last spring, and Man City finished second. Martens, recently crowned FIFA's 2017 Women's Player of the Year, got the most votes of any player honored. Renard was second, Bronze was third. Among the big global names who didn't make the cut are Australia's Sam Kerr (Chicago Red Stars), and Canada's Kadeisha Buchanan (Lyon) and Ashley Lawrence (PSG). Kerr finished ninth among forwards in the vote. You're likely to see almost all the players named above at next summer's World Cup (assuming their countries all qualify, of course). The only one who for sure won't be there is Abily. She retired from France's national team last summer, and told FIFPro she's likely to hang up her cleats for good when the club season ends in the spring. "For me to have this recognition at the end of my career is a great moment for all my years in football," she said. "I hope the 2019 World Cup in France will be an opportunity for more progress. I will cheer on the team in the stadium. I am looking forward to a great spectacle."